The birth of a child is supposed to be a happy time. The new parents are expected to look tired but elated, and to want to share their joy with friends and relatives, who crowd round offering gifts and advice. All this creates a perfect storm of negative feelings, which can lead to serious consequences. The first stage of escaping from this cycle is to acknowledge what you’re experiencing, and begin to talk about it. One Beijing couple who have been on this long and difficult journey are Tim Coghlan and Enoch Li. We spoke to them about the challenges they faced, and how they have met them through therapy and honesty. “The first few months were horrible,” Li told us frankly of the birth of her first child. For Coghlan too it was a difficult time. A video being shared on social media summed up the issue for Li. Li and Coghlan were able to find a way through their own crisis because they had previous experience of dealing with depression. When they first came to Beijing, Li was a high-flying executive at an international bank. “After we arrived I had severe migraines, and took time off work,” she told us. “I thought maybe it was pollution, heat, environmental factors… But the headaches kept coming. I saw every single specialist, I even went to Hong Kong to see a brain specialist. The diagnosis was a start, but the road ahead was still long and hard. “I started taking anti-depressants,” Li said. “I was still in complete denial. I kept asking ‘When do I go back to work?’ I went to see a psychologist every week, and had to promise him not to kill myself. The turning point came not in the sunshine, but on a chilly winter’s day. Using the bear gave them a way of externalizing and talking about Li’s depression. The road to recovery involved some significant life changes. For Coghlan there was more to this question. Li now runs Bearapy, a consultancy that helps companies from multinationals to SMEs and start-ups with change management, understanding employees’ well-being and preventing stress. The ideas which underpin her work come from both her academic studies and her own experience. Therapy helped her with opening up, she told us. “When we first met I wasn’t able to articulate my emotions. Tim’s a gem, he’s able to talk about what he feels. Some sessions he would sit in on, and we did a lot of couple therapy, but I also saw the therapist on my own. We had therapy pre-marriage, post-marriage, pre-baby… A lot of things we traced back to my childhood. What they have learned through therapy influences the choices they make as parents too. Part of this involves consciously making changes to the way she herself was brought up. “It’s not easy when I see her in mud. When I was a child everything had to be clean. But we let her be messy, try things on her own. We asked her what advice she had for parents facing difficulties with depression and anxiety. Life is rarely easy, and the challenges of parenthood never end. However, this couple’s story shows that even when things seem darkest, there is always a way back to happiness. 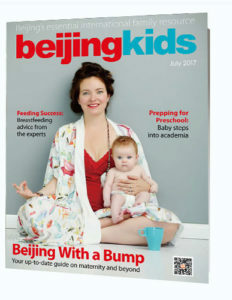 This article appeared on p. 55-56 of beijingkids July issue.